Scott Forehand is an accomplished systems architect, engineer, and administrator with over a decade of experience designing and managing virtual environments, networks, storage and server infrastructures and operations with a proven ability to create and automate solutions to improve productivity, reliability and performance. 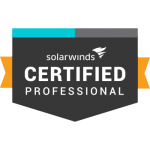 He has achieved multiple certifications in virtualization, networking, cloud, storage and other technologies, and is honored to be a VMware vExpert in 2018. Now that you have the download sources, what do you do with them? For starters, add them to VMware Update Manager (VUM). For detailed instructions on how to do that, check out my blog post on the subject, or VMware Docs. Select the host, click Manage, and keep Settings selected. So I recently migrated from a vSphere 5.5 environment to 6.5 using the migration utility. Overall, I had a great experience with a few exceptions, both of which were my fault. We’ll cover one of them in this post. 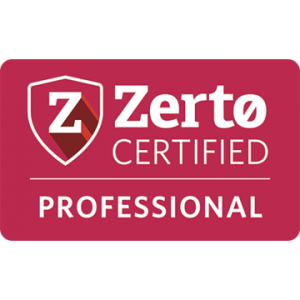 We were running Trend Micro Deep Security, which means we had NSX deployed in support of that product throughout our environment. My thinking, incorrectly, was that after the vCenter upgrade, I could upgrade the existing NSX components of the environment and I would be off to the races! After the vCenter upgrade was successful, I noticed that I no longer had an NSX manager registered, which was odd. I was seeing issues with DRS, and the only way to get around the virtual machines hanging and eventually erroring out during DRS triggered vMotions was to manually migrate the virtual machines to other hosts and place the affected host in Maintenance Mode while I took steps to remove all things NSX, Guest Introspection and Trend Micro. If you manage a Windows Server 2016 file server and your company won’t allow Quotas or File Screening for your file server, or even worse hasn’t bothered defining data retention policies, you’ve probably found yourself running low on storage. A new feature in Windows Server 2016, Data Deduplication, can help you address the pesky problem of running low on space by, well, deduplicating your data. What does that mean? Read the Data Deduplication Overview from Microsoft to find out what the Data Deduplication feature is, and how it can help you reclaim your sanity. 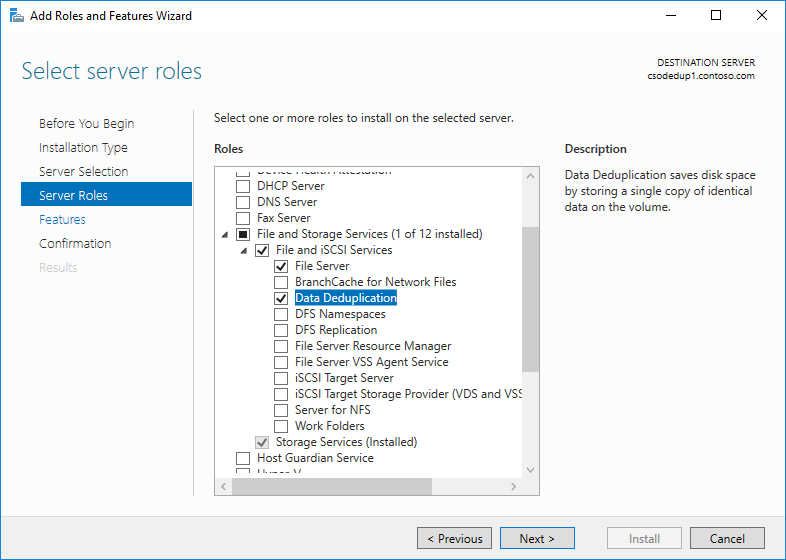 In Windows Server 2016, Data Deduplication is a role that can be installed. You’ll find the role under File and Storage Services, File and iSCSI Services. In the Add Roles and Features wizard, select Server Roles. Expand File and Storage Services. 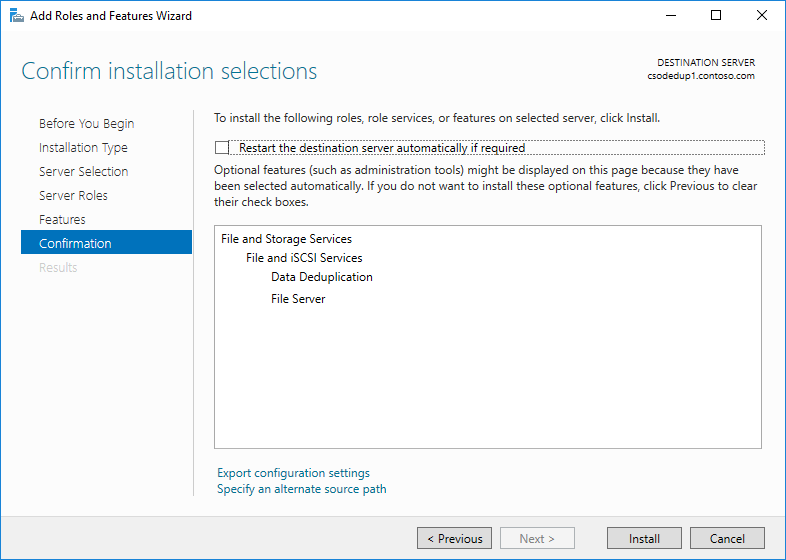 Expand File and iSCSI Services. Select the Data Deduplication role. 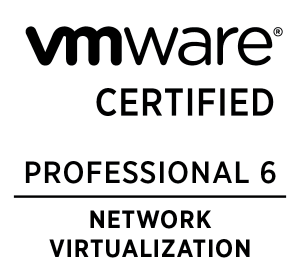 Well, some of you might have seen my original VMware Certification and You post back in March. 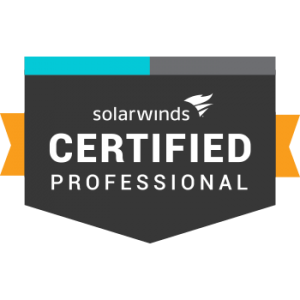 VMware is in the process of changing the way their certifications work, and for the better I think. With those changes comes a short eBook: VMware Training Value. In Part 2 of the Homelab Considerations series, we’ll be talking about storage simulators. Storage simulators will help you familiarize yourself with various enterprise storage offerings that you would typically see attached to a vSphere environment. We’re going to cover each Virtual Storage Appliance (VSA) I’ve been able to find, where and how to download those VSAs, and how to set them up in an environment. While on vacation with my wife in Las Vegas, I got some pretty exciting news. I’m proud and honored to be named as a VMware vExpert in 2018, and humbled to be among the talent and dedication that exists within the vExpert community. My only regret is that I didn’t make more of an effort earlier on. 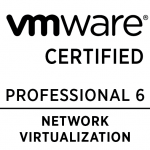 I encourage anyone with an interest in virtualization, or networking with people in the industry to make an effort to become a part of this community. So I’ve been digging into how to license enterprise software for my homelab, and I thought I’d share some of what I’ve found. Some people choose to go the route of getting below-board licensing for enterprise software, but I’m not one of those people. For those of us who want a legitimate software footprint on their network, this post is for you. We are not going to cover how to build your homelab, or what storage you should use. 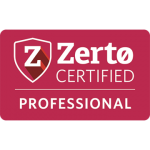 We are going to cover how to license your homelab at little or no cost to you, including your choices for legally licensing products from VMware, Microsoft, Veeam and more. I thought I’d take a moment to remind everyone that the End of General Support (EOGS) for vSphere 5.5 and vSAN 5.5 is September 19, 2018. VMware recommends that anyone still running those versions of the software upgrade to vSphere 6.5 or vSphere 6.7 as soon as possible to maintain your full level of Support and Subscription Services. Upgrading to vSphere 6.5 or 6.7 will put you in a good spot, and give you all of the latest capabilities of vSphere and vSAN. VMware has announced that vSphere 6.5 and vSphere 6.7 general support has been extended to five years from it’s release date, which will end on November 15, 2021. 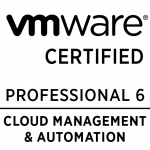 Note: vCloud Suite 5 and vSphere with Operations Management (vSOM) customers running vSphere 5.5 are also recommended to upgrade to vSphere 6.5 or vSphere 6.7. Visit the VMware vSphere Upgrade Center for more information on the benefits of upgrading and how to upgrade from vSphere 5.5 to vSphere 6.5 or vSphere 6.7. If you’re looking for detailed technical guidance, visit vSphere Central and the vSphere 6.5 Topology and Upgrade Planning Tool. 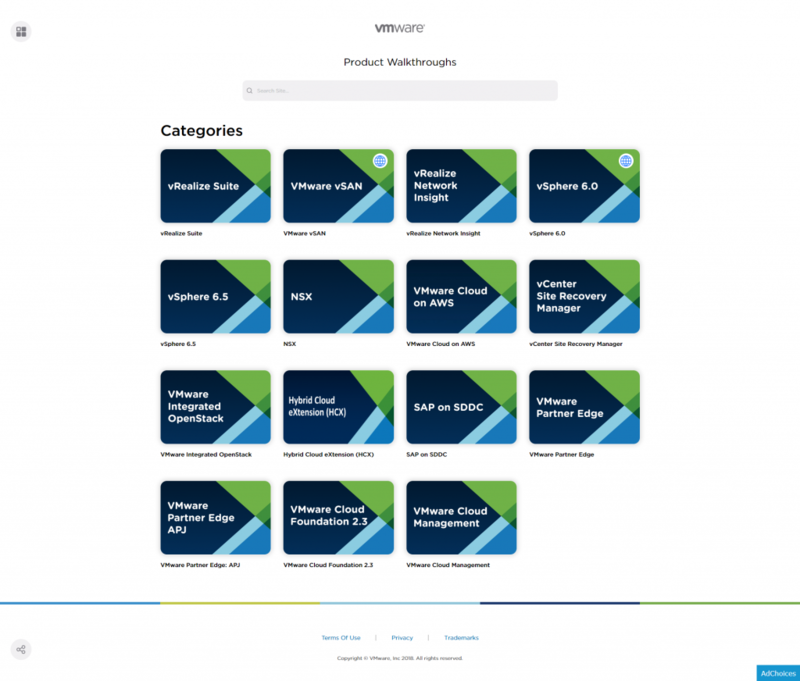 Allow me to introduce the VMware Product Walkthrough website. The site is mobile friendly, and pretty intuitive. This tool provides technical overviews and step-by-step guides for installing, configuring and managing VMware products and services. Every single walkthrough includes screenshots and detailed explainations. As of yesterday, Veeam has officially released a new version of Veeam Backup & Replication. The update includes support for new platforms, a large number of ecosystem changes in support of the upcoming set of Veeam capabilities due later in 2018 that were showcased at the VeeamON conference, some optimization for technologies like direct SAN access and virtual appliance modes, and some bug fixes. Veeam is planning a larger update coming soon, which will carry the Update 4 mantle. Install Veeam Backup & Replication 9.5 Update 3a on the new Windows operating systems. Install components (such as proxies, repositories, etc.) on the new Windows operating systems. Perform backup and replication jobs from the new vSphere platforms and the Hyper-V roles in the Microsoft Windows Server 1803 operating system. vSphere Deployment is a 6 part series that will walk you through deploying and configuring the components of vSphere 6.5.
vSphere HA clusters allow ESXi hosts to work together as a group and provide performance assurance and higher levels of availability for hosted virtual machines. Before we get into building vSphere HA clusters, let’s go over how vSphere HA works. vSphere HA provides high availability for virtual machines by pooling the virtual machines and the hosts they reside on into a cluster of ESXi hosts. Hosts in the cluster are actively monitored through a network and datastore heartbeating and if a failure occurs, the virtual machines on failed hosts are automatically restarted on alternate hosts. For those unfamiliar, VMware ESXi is VMwares purpose-built, bare metal hypervisor that installs directly onto a physical server. You’ll need a host compatible with vSphere 6.5 (compatibility guide available here). You’ll need the ESXi 6.5 ISO image (available here). I also recommend that you check out the vendor-specific (Dell EMC, HPE) ESXi builds if you want to avoid installing drivers, etc. 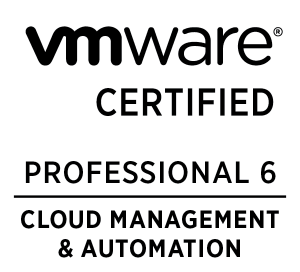 You’ll want to keep the vSphere Installation and Setup – VMware vSphere 6.5 documentation handy. Ensure that all shared storage is disconnected from the host when installing ESXi. An administrator can add both computers and users to security groups. Then the administrator can specify which security groups are affected by the GPO by using the Access Control List (ACL) editor. To start the ACL editor, select the Security tab of the property page for the GPO. Then set access permissions using discretionary access control lists (DACLs) to allow or deny access to the GPO by specified groups. By changing the Access Control Entries (ACEs) within the DACL, the effect of any GPO can be modified to exclude or include the members of any security group. For more information about security groups, see How Security Groups are Used in Access Control. The views and comments expressed on this site are strictly the views of the authors, and not the opinions or views of their employers in any way.